Our family has a tendency to be a little unconventional when it comes to gift-giving. We take great joy in finding things that are eminently practical or supremely delightful and, as a result, we generally give rather odd tokens of our affection. My mother was the latest recipient of just such a gift. She has been systematically organizing her preparedness stores and basic pantry staples (complete with 15 feet of new industrial shelving!) however, her water storage capabilities were cumbersome and not particularly efficient. Realizing that toting around 5 gallon barrels of water made life more than a little difficult during their frequent power outages, we bought a few WaterBricks to make her life a little easier. WaterBricks are a fairly new water storage system. They consist of 3 1/2 gallon, heavy duty, plastic containers that stack, interlocking in a manner somewhat akin to Lego's. Each Brick has two holes in them, increasing their structural integrity and even giving you the ability to drive PVC, Rebar or other construction material through the middle of the Bricks, in essence, forming an incredibly sturdy, stand-alone wall. We ordered directly from WaterBrick International, although there are many other online sources, including Amazon from which to purchase the "bricks". Although I really wanted O.D. (olive drab - there was a picture of them on their website), but they don't currently carry that color, so we had to settle for tan. They do make the WaterBrick in blue (the universal color for a water container), however, we preferred the tan. The color was much nicer than I expected, more of a khaki than anything else and it satisfied my love of all things "subdued". I love them for their versatility. 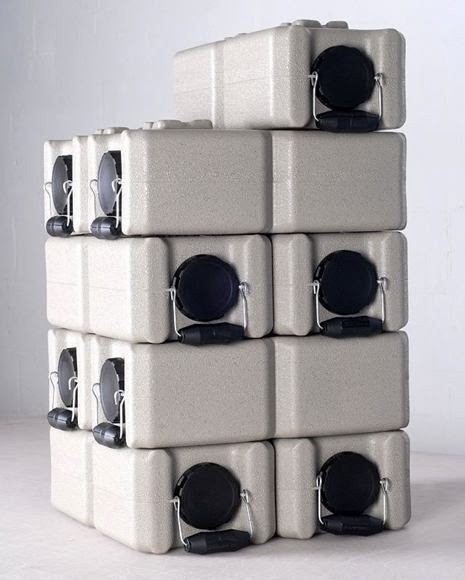 The first thing that caught my interest was the fact that they are a freezable water storage option. Long-term water storage is challenging in northern climate simply due to the fact that winters are cold and water will freeze and expand, rupturing most water containers. You can fill plastic barrels a bit under full, so there is room for expansion, but even then, after being frozen a number of times, the plastic does succumb to the pressure and burst. These containers were designed to be frozen! That means that I can keep a WaterBrick in the back of our truck, even during the winter months. I can keep them in our storage container and out of the house. I can strap one onto our 4-wheeler, put them in our shed or basically any other out-of-the-way spot and feel confident that they will be full and ready for use in any emergency situation. 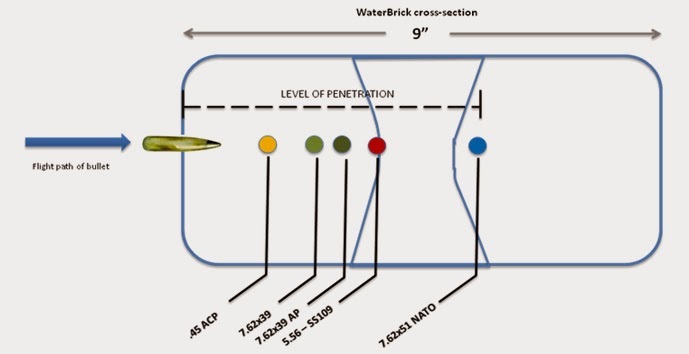 Another thing that I love about the Waterbrick is the fact that they stack to form tall towers or walls or in any other configuration you can think of. They were designed to interlock and they even have grooves so that you can "tie" them together with ratchet straps. If you have limited space, you can built a wall of water against your garage wall, taking up very little space, strap them together, and have a huge water supply! I think that is amazing. WaterBricks are NOT just for storing water. They are watertight (of course), so they are perfect for storing bulk food, matches, (reloading) powder - just about anything you can think of. O.K., so what really sold me? The military has tested the ballistic capabilities of the WaterBrick and are now using them to build expedient bunkers! Really! When filled with sand or pea gravel, the Waterbrick provides ballistic protection - in other words - they are bullet proof! Although too expensive for normal people to build a bunker out of, a few of them could be stacked under a window, providing a "bullet-proof" shooting position. Wow. Now you can store water and build a bunker, out of the same handy containers! Every housewife should have a few of these beauties laying around! If Sir Knight and I had a limitless pocketbook (which we don't, of course), we would stack these high! We would put all of our food stores in them (easy to deal with, 3 1/2 gallons at a time) in an effort to protect our supplies from flood, rodent infestation and earthquake dangers. We would build walls of water storage and have a supply filled with sand and pea gravel to act as bunker walls and even sand-bags in the event of a flood. They are so versatile! Even on a limited budget, WaterBricks are worth having around. We keep at least 1 WaterBrick in each vehicle and a number in the house, full of water. We will add a few here and there and eventually have a respectable supply. Sorry to sound like a walking advertisement - I just thought these were too cool to keep to myself! Let me know if you have WaterBricks and how you use them! *By the way - my mom LOVES her WaterBricks! She has relegated her old 5 gallon water barrels to the shelving and has installed her Bricks as her new household water storage. We get excited about the funniest things! My husband and I need to check this water storage system out. Thank you for sharing and posting about the gift that keeps giving, the WaterBrick. 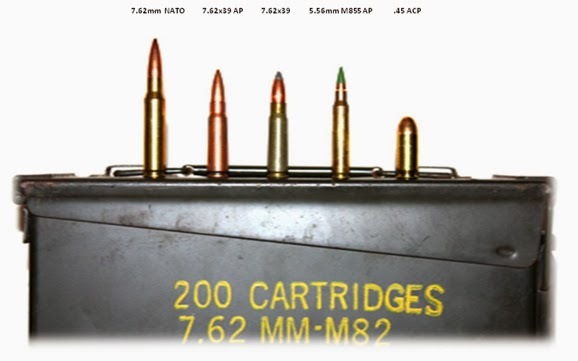 by the way .. the ballistic value is probably decreased significantly if these have water in them instead of sand. Sand absorbs the energy, water transfers it so while the first bullet or two may not go through .. they will probably rupture the brick. Very interesting and versatile product. Thanks for sharing. Thanks! I just flipped over to Amazon and ordered some. I'm on Day 6 of no water because of busted water pipes and quickly using up my emergency supply. Have decided to INCREASE my supply. I've been pondering on how to carry water in my vehicle during the winter months! Will definitely be looking into these. I like them, like the stackable idea...what I don't like is 143.00 for 8? thats heavy! I LOVE mine and can’t thank you enough for introducing me to them!! They make outdoor water storage viable (and stand up to my kids building forts with them— yes, REALLY)!! Currently, we have 12, filled with water and stacked against the counter (they also make a handy step-stool for reaching a high shelf). I like them so much, I have a jar where I save up money for special prep purchases, and WaterBricks are on the short list.